A 50-year-old man has surprised fellow residents when he married three women at at once. Mohammad Ssemanda is a food vendor in Wakiso district at Kasenyi landing site in Uganda. 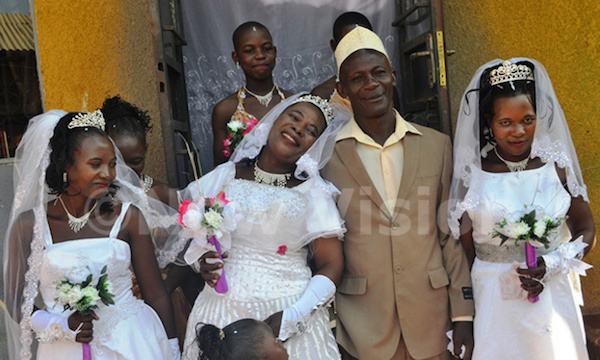 The wedding ceremony held on Wednesday afternoon at one Sophia Namaalo’s home, Nkumba Parish, Katabi town council in Wakiso district, astonished many residents on seeing one man being surrounded by three women clad in wedding gowns. The brides included a 48-year-old Salmat Naluwugge, the first wife to Ssemanda and with whom they have spent 20 years with five children. Others were, Jameo Nakayiza, a 27-year- old and Mastulah Namwanje aged 24 who are as well sisters. They also have children. Ssemanda revealed that all his wives came into marriage knowing that he was not doing very well financially, but love him. “My wives are not jealous against each other. Good enough, each has got a home and I promise to work harder and support them,” Ssemanda said. On behalf of the three wives, Salmat Naluwugge praised Allah for having made their wedding possible and having granted her a 20-year blissful relationship with Ssemanda. “I thank our husband for marrying us all at once, a sign that he will not discriminate or sideline any of us,” a visibly overjoyed Naluwugge said. Sheikh Swaleh Mugenyi who performed the marriage rituals, assured that it was not against Islam and advised the brides and their groom to stick to their religion and Allah in whatever they do. Some of the residents praised Ssemanda’s move of marrying three women at once saying, it saves costs.